In 1983 New Zealanders watched as their own Lorraine Downes was crowned Miss Universe. The popularity of beauty contests declined after their heyday in the late 1970s and early 1980s, but there are still a range of competitions for women, men, drag queens, gay men and women from particular ethnic groups. The first beauty contests for women began in the mid-1800s. The women were usually judged on the basis of photos, and did not appear in the flesh. There were also contests for babies and children, and for men. From the early 1900s women actually appeared in the competitions, and in the 1920s swimsuit parades began to be included. Critics considered these competitions immodest and undignified. Beauty contests were often held at summer carnivals and rural show days. The first Miss New Zealand contest was held in Auckland in 1926. It was open only to single women, and the winner was chosen by a public vote. It was a high-profile competition, but was not held regularly until 1960, when it became annual. Thousands of women entered, attracted by the prizes and the chance to change their lives. The competition final was first televised in 1970 and attracted large audiences. The Miss Universe New Zealand competition began in 1979. In 1983 Lorraine Downes became New Zealand’s most internationally successful beauty queen when she was crowned Miss Universe. In the 1980s the Mr New Zealand competition for men and the Mrs New Zealand competition for married women began. Supporters of the competitions thought they built young women’s confidence and gave women good role models. Critics believed the contests were degrading to women, being primarily based on participants’ looks and body shape. Protests increased with the rise of feminism from the 1970s. 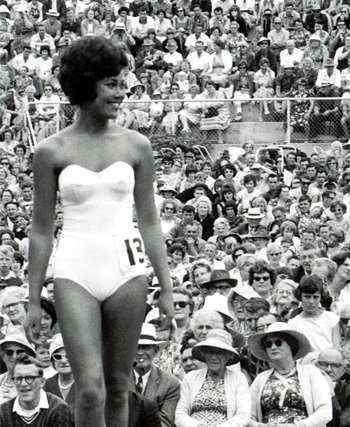 Beauty contests declined in popularity from the late 1980s, and were no longer televised. However, in the 2000s a diverse range of contests were held, including competitions for married women, girls, teenagers and men, both gay and straight, as well as for people of particular ethnicities, such as Indians and Pacific Islanders.